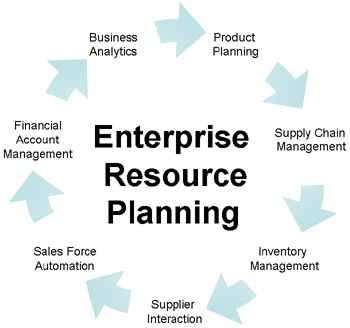 I read a recent article that caught my attention, which asked where will Enterprise Resource Planning (ERP) be in two years. I suspect that was its only purpose, to get my attention. Well, it did as I hope this article catches your eyes. What is an ERP solution? In its simplest terms an Enterprise solution purpose is to integrate an entire organization and its software modules are arranged by functional or departmental roles. The goal is to ensure that the left hand knows what the right hand is doing. There are dashboards, and metrics established that give management a quick high level overview of operations with detailed drill down for detail when necessary. The software provides real-time status of operations. Staff personnel have access to information necessary to solve customer service inquiries, account status, and collection questions in a timely manner. This goal is no small task, but the promise of a more efficient enterprise which will help to drive down costs, particularly when inventory is integrated, is a driving force for change. This “need” is not likely to diminish over time. It actually will increase. A typical life cycle of an ERP solution is 3-5 years. Longer if there is a good relationship between the enterprise and the software developer and the hardware is reliable. Less if there is a poor fit between the challenges and solution and even less if heavy modifications were made in an inconsistent way. Why? Efficiency drives cost savings which help the bottom line. Most company’s staff is already overworked and is performing the duties of multiple people. Not really a stress reducer environment. Most companies if they have survived the last few years have already undergone cost and efficiency programs including six-sigma and TCV efforts. At what point can you squeeze more liquid from a dry rock? You get to the point of diminishing returns. You need to start looking for different ways to accomplish the same task. Surprisingly the solutions sometimes incorporate more steps. There is an old saying in computer technologies, “Garbage in, garbage out”. Which means that funneling the same old unreliable information through an old or new solution will not yield better results. It is like drawing a circle with straight lines. You start with a triangle. It works but it looks like a triangle and there is lots of waste. Add another side and you have a square. More sides (steps), less waste, but still not looking like a circle. Well add enough steps and you get something that approaches a circle. More steps, more detail, better results. You can also reach a point where more steps added do not help anymore. It takes time and experience to figure out at which point the effort becomes overkill. Better results equals more confidence. More confidence in your system improves buy-in and acceptance of new processes. This ultimately works to improve efficiencies. We hope for more simple implementations, but we should really concentrate on the results and let the experts assist with the technical side and business owners can concentrate on running their business. So what will the future entail for ERP solutions? Better fit for one. Companies that are looking to be leaders in their industry and want to compete globally will need to keep searching for new more tightly integrated solutions. The landscape of on premise or hosted solutions is where most companies will see changes. There are many factors to consider including financial incentives from governing bodies as to which type of solution fits an organizations budget best. But, the need for change is not going away any time in the future. We all do not have circular businesses, so those steps that become smaller and easier, because they are smaller will fit better to our odd-shaped business processes. You are not alone and not unique. Other companies in your industry have likely faced similar challenges. One of your first challenges is finding the right partners to team with. A consulting firm like Dolvin Consulting helps you to navigate the maze of choices and match your challenges with available solutions and solution providers. May I suggest that you contact us to begin the process? We cannot promise anything other than to do our best and always remember that you are our client.